OT outcome measures are crucial to your clinical success. Measuring outcomes is a very important part of occupational therapy practice. OT outcome measures are used to determine value and effectiveness of treatment in therapy. These measures are often completed at the start of therapy to determine baseline function and then again, at the end of therapy to assess progress and determine treatment efficacy. In consideration of these goals, OT outcome measures help therapists analyze the effectiveness of their treatment interventions, use evidence-based practice, and provide treatment that is client-centered. For companies and organizations, OT outcome measures can help determine the value of therapy and reduce healthcare costs while improving efficiency. Moreover, insurances require credible, objectifiable outcome measures, with Medicare and Medicaid documentation making a requirement to discuss patient goals. When determining the appropriate outcome measure to use in practice, individuals often seek specific measures for specific diagnoses. For example, the Disabilities of the Arm, Shoulder, and Hand (the DASH or QuickDASH) is often used for upper extremity injuries in therapy practice. We as practitioners know that time is valuable when evaluating patients and that documentation can be a tedious, time-consuming task. Productivity standards have continued to increase. Considering time, productivity, and documentation issues, many therapists are apprehensive to add additional measures to their practice. These measures are generic, meaning they address a wide variety of diagnoses and patient populations and are applicable to most conditions seen for rehabilitation services. Since they are self-report measures, the patient can be independent while filling out the details and answers. You can even have them fill out the forms while in the waiting room prior to treatment. They take less than two minutes to score and record in your documentation. They are also reliable and valid means to address the three outcome measure goals we previously mentioned above. 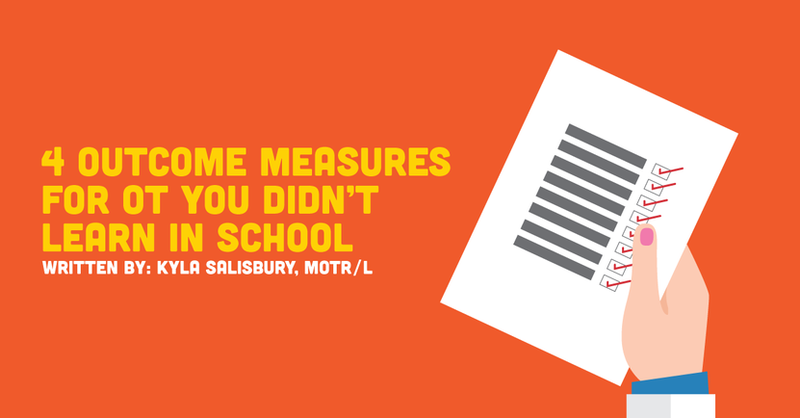 These OT outcome measures need to be added to your practice today! The Single Assessment Numeric Evaluation (SANE) is a single question measure providing the client's perspective on their current level of function. It is the quickest of the four measures discussed in this article and offers a great way to show progress. Scoring is simple; the therapist simply records the patient’s percentage in their report at initial evaluation, at progress note, and at the final discharge report. A SANE percentage that is closer to 100% is best. The second in our list OT outcome measures is The Patient Specific Functional Scale (PSFS). This measure is best used to quantify activity limitations prior to treatment and to determine changes in activity limitations following therapy treatment. The PSFS allows patients to select five functional activities/tasks that are that are most important to the patient. Functional activities include what is meaningful and important for the patient to participate in. For example, activities could include cooking, caring for children, or returning to athletics or running. Once activities are selected, the patient then measures participation or limitations in participation in these tasks. The function is recorded on a scale from 0 (unable to perform the activity) to 10 (able to perform the activity the same as prior to injury/illness). To score, numbers are totaled to yield a score out of 50. The closer a patient is to scoring to scoring 50, the better. Importantly, the PSFS directly meets Medicare/Medicaid requirement of discussing patient goals. The 4-Item Pain Intensity Measure (P4) is a timely measure offering a comprehensive picture of a patient’s pain experiences in the past two days. This measure asks the patient to rate the average pain intensity on a scale from zero, no pain, to 10, worst pain possible for the morning, afternoon, evening, and with activity. To score, numbers are totaled to yield a score out of 40. The lower the score, the better. The P4 takes the patient less than a minute to complete and the therapist less than 5 seconds to score. The Global Rating of Change Scale (GRC) provides a rating on whether a patient has deteriorated or improved during the course of therapy treatment. The GRC is a visual analog scale, prompting the patient to notate the overall condition of the injury from the time that you began treatment until now. At the left of visual analog scale, measurements indicate a worsening of disability/pain and range from “a very great deal worse” to “a tiny bit worse, almost the same". The middle of the scale indicates the patient’s status has remained relatively the same with a score of “no change". When used in combination, the aforementioned OT outcome measures require 10 minutes or less to complete. Remember, OT outcome measures are used to assess progress and change in therapy over time, so be prepared with free copies of assessments. Including a patient’s self-report into your documentation will not only help you meet documentation criteria, it will also facilitate client/therapist rapport and patient “buy-in". Additionally, you, your clinic, and the profession as a whole, will be able to critically determine the effectiveness of interventions and the value of occupational therapy as an important part of the healthcare system. Interested in taking on research all on your own? Learn more about how new grad OTs can produce research independently.